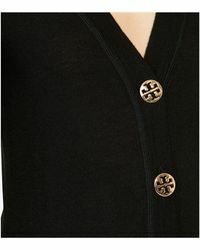 Tory Burch is a revered, international fashion designer based in New York. Combining her extensive knowledge of vintage style with a modern and eclectic sensibility, Tory Burch brings forth refined collections of elegant styles, which are at the top of every urban-ready sophisticate's must-have list. 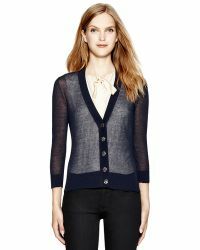 When it comes to exuding Park Avenue-like perfection it has to be the Tory Burch Simone Cardigan. 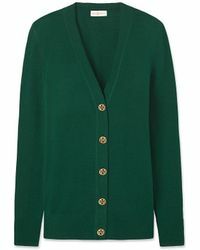 This elevated knitwear staple is offered in super-soft, merino wool and is refined with gold-tone, signature buttons. Whether you're dressing for the office or the weekend, this chic piece is an investment in on-point perfection.